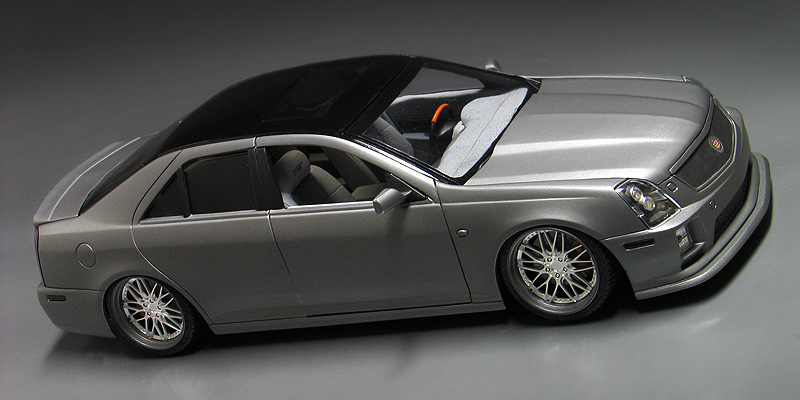 When Revell came out with their Revell Cadillac STS-V kit a few years ago I bought one because I thought it was a cool, yet obscure car and unique subject matter for a model kit. I think most serious builders have probably dismissed the kit because of it's snapkit-like assembly, toy-like 24" wheels and working "Lambo" doors. But, if you can get past these characteristics a pretty nice kit is hidden underneath. Built out of the box, this kit is way over the top with it's loud graphics and so on. But, the real cars are sophisticated luxury sports machines and I wanted to build mine in this style, but with a few subtle custom touches. The first change I made was to glue the doors shut to the STS-V body. I debated keeping the scissor doors, but they never seem to shut tight and have all the body lines line up correctly on the built examples I've seen. Plus I don't really play with my models once they are done, so eliminating the working feature allowed me to fit the doors better. Secondly, I ground off the original lower front air dam with a dremel too and made a new front splitter from sheet styrene. I think it added a subtle but aggressive look to the front of the car. BMW offers some of their models in a color called "Frost Gray" which is a matte finish metallic gray. 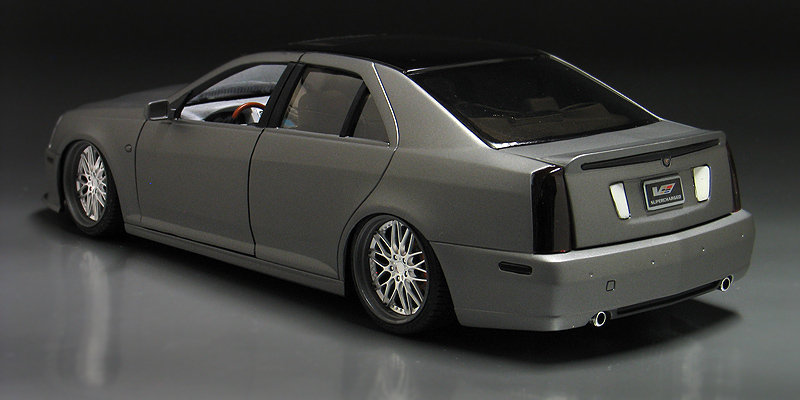 I wanted to mimick that color and sprayed my Cadillac with Testors titanium metalizer paint which has a nice flat look to it. I also painted the grill pieces and wheel rims this color at the same time for a monochromatic look. As a contrast I painted the upper roof section with testors gloss black. The gloss roof visually blends into the tinted windows and makes it look like a one-piece glass roof. The taillights and running lights were all painted to look as if they were tinted too. The kit wheels were swapped with a set of 20" Leonhardiritt Bugel wheels made by Aoshima. These wheels come with separate wheel lips plated in chrome, but I painted them body color instead for a west-coast look. I then slammed the suspension and adjusted the wheel fitment so they were sitting flush. I also added a big brake upgrade which are my own resin cast pieces. I painted the engine bay, stereo boxes and brake calipers bright orange to add a little excitement to these areas. The rest of Cadillac the was built right out of the box. 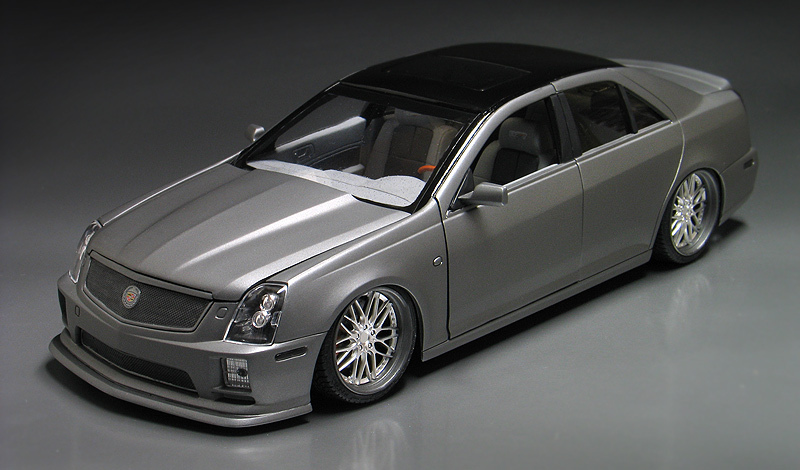 My Cadillac STS-V is a subtle ride and built the way I build a real one to have as a daily driver.